In case you were wondering, yes, EA studio Danger Close is currently at work on a new Medal of Honor game. The future of the Medal of Honor franchise has been hazy ever since the 2010 reboot was released last October. 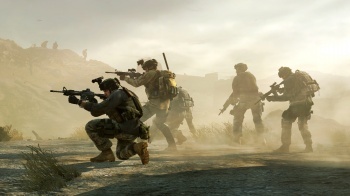 On one hand, it punched out an impressive-sounding 1.5 million unit sales in its first five days of release; on the other, Modern Warfare 2 sold seven million units in one freakin' day. On November 2, EA Vice President Patrick Soderlund said the game "didn't meet our quality expectations," but on November 3, EA Chief Executive John Riccitiello proclaimed that "consumer feedback has been strong to suggest that we've got a franchise now." Not exactly crystal clear, is it? Fortunately, we have Danger Close to provide some clarity. "Yes, Danger Close is currently working on the next Medal of Honor," Executive Producer Greg Goodrich revealed at medalofhonor.com. "Since our launch last October, we've studied, listened and absorbed much of your feedback and are very excited to be marching forward on the next title. We can't wait to tell you more about it, so check back often to the website and the fan page on Facebook." "It's going to be a fun ride for the Medal of Honor franchise," he added. So there you have it. EA recently announced that MoH had reached five million copies sold, still nowhere near Modern Warfare territory but a very respectable number nonetheless. A sequel isn't exactly an Earth-shattering surprise, given Riccitiello's recent description of the property as one of EA's "strong, growing franchises," but it's always nice to get a straight-up confirmation, too.